The Final General Plan and Environmental Impact Report (Dated February 2015) is now complete and available for viewing and downloading by clicking HERE. In addition, you can find the document by navigating to the “Maps and Documents” section at the bottom of this webpage and click on “Final General Plan/EIR”. 4) Adjustments to the boundaries of the Cuyamaca Mountains State Wilderness, reducing the overall acreage from 13,301-acres to 12,504-acres. The Final General Plan and EIR incorporates changes based on the responses to public comments which were received during the 45-day CEQA public review period (which occurred August 21, 2014 to October 6, 2014). Changes incorporated into the Final General Plan are within the Response to Comments document (also available on the General Plan webpage). A Notice of Determination was filed with the Office of Planning and Research on November 19, 2014. Thank you to all Park stakeholders, partners, agencies, elected officials, staff and general public who participated in the planning process and made significant contributions to the General Plan. A Notice of Determination (NOD) for the Draft EIR was signed and approved on November 19, 2014 and was posted with the State Clearinghouse for a 30-day statute of limitations. The NOD can be downloaded from a link on the right side of this webpage found under “Public Participation”. Comments received during the Preliminary General Plan/Draft EIR public review period as well as responses may be found in the “Maps and Documents” section at the bottom of this webpage. Click on “Public Comments and Responses – CRSP Preliminary General Plan-DEIR” to view or download the document. The Preliminary General Plan and Draft EIR was available for public review and comment during the 45-day public review period which occurred from August 21, 2014 to October 6, 2014. All comments received by the October 6 deadline received a written response and will be included as part of the Final General Plan/EIR following approval of the General Plan by the State Park and Recreation Commission. Any changes to the General Plan/EIR as a result of public and Commission review shall be incorporated. Thank you to all who submitted comments. The California State Park and Recreation Commission will meet on Friday, November 14th, 2014 at 9:00 a.m. in the Garcia Auditorium of the Caltrans District 11 building, 4050 Taylor Street, in San Diego. At the hearing the Commission will consider and take possible action on the Department recommendation to approve the General Plan and Environmental Impact Report for Cuyamaca Rancho State Park. Any person may file a statement regarding meeting items by writing to State Park and Recreation Commission, P.O. Box 942896, Sacramento, CA 94296-0001, by emailing P&RCommission@parks.ca.gov, phoning 916/653-0524, or by presenting oral or written statements at the Friday meeting at 9:00 a.m. or as soon thereafter as the matter may be heard. 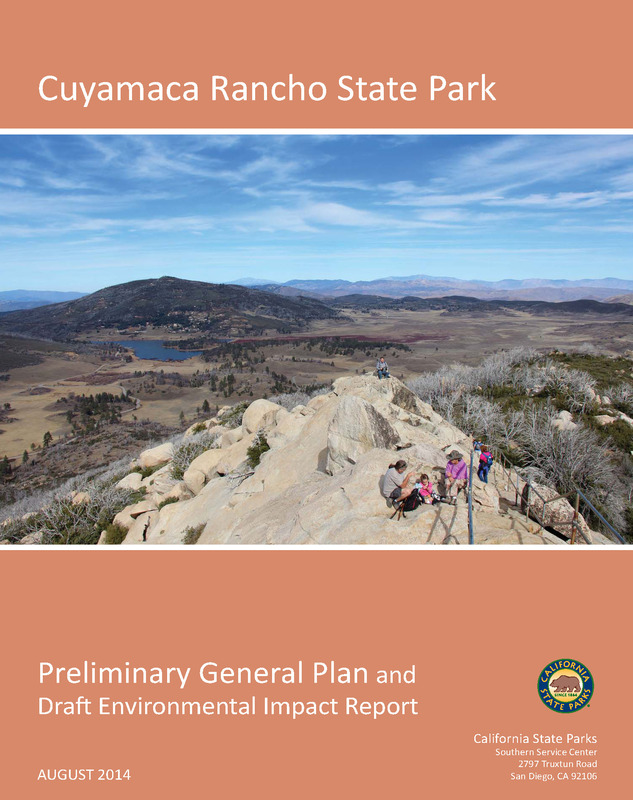 The Cuyamaca Rancho State Park - Preliminary General Plan and Draft EIR was available for public review and comment during the 45-day public review period which occurred from August 21, 2014 to October 6, 2014. All comments received by the October 6 deadline will receive a written response published in the Final General Plan/EIR. Additional comments are welcome after the deadline, however they may not receive a written response. An electronic version of the General Plan/DEIR is available for viewing and downloading by clicking HERE. California State Parks is proposing to adjust select wilderness boundaries and decommission particular areas of existing wilderness at the Park. To view a map and description of proposed changes go to “Maps and Documents” at the bottom of this webpage and click on “Click HERE" for Cuyamaca Mountains State Wilderness – Proposed Boundary Adjustments Map and Description”. We welcome your questions and comments about this proposal – email them to the address shown at right. A second mountain bike stakeholder group meeting was held May 22, 2014 at the California State Parks Southern Service Center offices at NTC Liberty Station, Barracks 26, 2797 Truxtun Road, San Diego, CA 92106. CSP staff heard and discussed comments from two mountain bike representatives regarding proposals from the Administrative Draft General Plan. Notes from the meeting can be found at the bottom of this webpage under “Maps and Documents”. A second equestrian stakeholder group meeting was held May 27, 2014 at Denny’s Restaurant, 665 N. Mollison Avenue, El Cajon, CA 92021. Six equestrians and three CSP staff participated in discussing equestrian comments about the Administrative Draft General Plan. Notes from the meeting can be found at the bottom of this webpage under “Maps and Documents”. For more information or to provide input, please contact equestrian liaison Terry Jorgensen (Back Country Horsemen and Ramona Trails Association) at tlh9749@yahoo.com. Documents and public comments from the 3rd Public Meeting held November 12, 2013 at the Marriott San Diego Mission Valley Hotel are available for viewing and/or download at the bottom of this webpage under the heading “Maps and Documents”. Click on “Click HERE for 3rd Public Meeting Maps, Documents and Presentations” to access the documents. These documents include the Highlights of the Preferred Alternative, as well as public verbal and written comments about the information presented at the meeting. The document entitled "Highlights of the Preferred Alternative" is available for viewing and/or downloading at the end of this webpage under the heading "Maps and Documents". To access the document, click on "Click HERE for 3rd Public Meeting Maps, Documents and Presentations". You may review the "Highlights" document to become familiar with the Preferred Alternative of the Management Zones Map and Matrix as well as some draft General Plan proposals. This document was available as a handout at the 3rd Public Meeting held Tuesday, November 12, 2013. 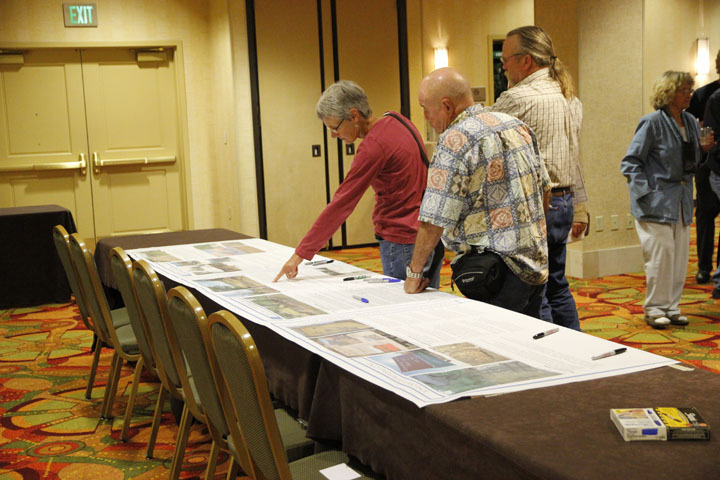 THIRD PUBLIC MEETING: The third and final public meeting was held Tuesday, November 12, 2013 from 6:00 PM to 8:00 PM at the Marriott San Diego Mission Valley Hotel, in the Cabrillo Room, 8757 Rio San Diego Drive, San Diego, CA 92108. A presentation of the Preferred Alternative Plan was made followed by a public comment period. California State Park planning team staff was in attendance to answer questions and take comments. See "Maps and Documents" section below to view meeting invitation, agenda, draft preferred alternative management zone map and matrix. Thank you to all who attended. A mountain bike stakeholder group meeting was held on August 13, 2013 at the California State Parks Southern Service Center offices at NTC Liberty Station, Barracks 26, 2797 Truxtun Road, San Diego, CA 92106. Four mountain bikers and two California State Park staff participated in discussing issues of importance to mountain bikers. Information about the meeting is contained in the meeting agenda and notes which can be found at the bottom of this webpage under "Maps and Documents". An equestrian stakeholder group meeting was held June 25, 2013 from 6:00 PM to 8:00 PM at the Ramona Community Center in Ramona. Eight equestrians and three California State Park staff participated in discussing issues of interest to equestrians. Information about the meeting is contained in the meeting agenda and notes which can be found at the bottom of this webpage under "Maps and Documents". For more information or to provide input, please contact equestrian liaison Terry Jorgensen (Back Country Horsemen and Ramona Trails Association) at tlh9749@yahoo.com. 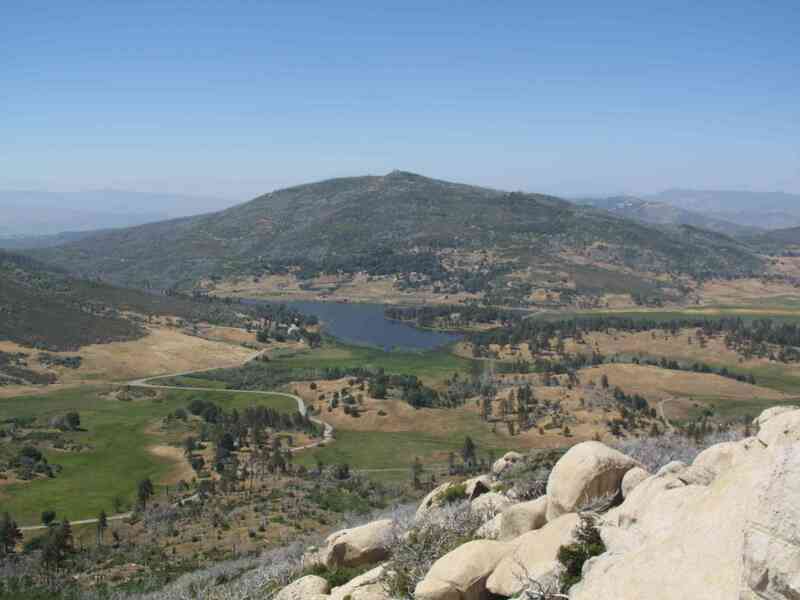 The California Department of Parks and Recreation (CDPR) will be preparing an Environmental Impact Report (EIR) and will combine it with the Draft General Plan for Cuyamaca Rancho State Park in compliance with the California Environmental Quality Act (CEQA). An Initial Study (IS) has been prepared providing a preliminary review of potential impacts associated with changes that may be proposed to the Park as called for in the Draft General Plan. The IS as well as a Notice of Preparation (NOP) indicating that an EIR will be prepared may be viewed and/or downloaded under the Public Participation heading on the right hand side of this page. The NOP and IS has been made available to agencies that CDPR has determined may have an interest in commenting or acting as a responsible or trustee agency through the CEQA process. A 30-day review process began April 9, 2013 for responsible or trustee agencies to provide specific information regarding their area of statutory responsibility. Comments from the public are also welcome regarding the IS as well as other potential impacts associated with changes proposed by the Draft General Plan. The changes proposed are not yet completely defined, but shall be further defined as progress on the Draft General Plan continues. 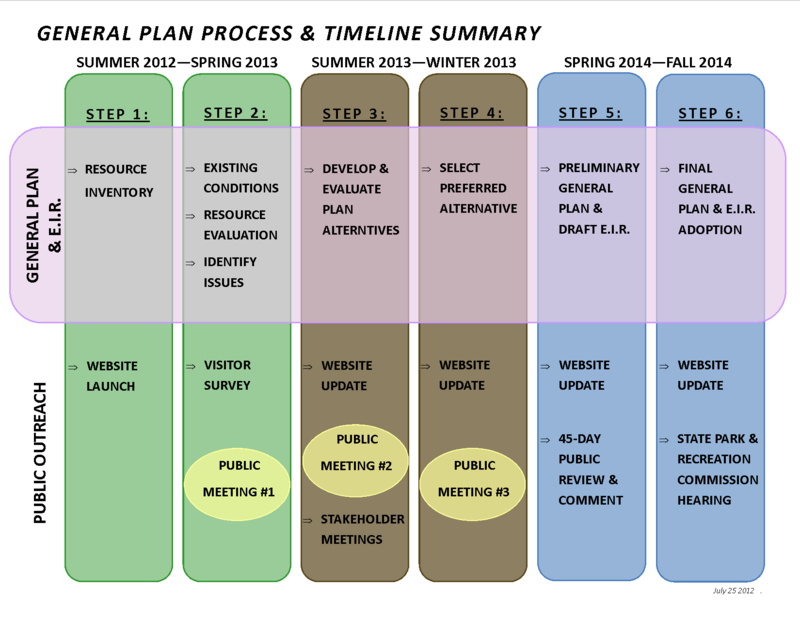 The combined Preliminary General Plan/Draft EIR will be made available for a 45-day public comment period once they are completed (most likely Spring 2014). Please check back to this webpage for updated information. 2nd Public Meeting - The second Public Meeting was held May 23, 2013 from 6:00 PM to 8:00 PM at the Marriott San Diego Mission Valley, "Cabrillo" Room, 8757 Rio San Diego Drive, San Diego, CA 92108. See "Maps and Documents" section below to download maps, documents, and presentations from the second public meeting. Initial Public Outreach Summary: A document summarizing the public input received from the first public meeting and on-line visitor survey can be found in the "Maps and Documents" section below. Check this out for a good introduction to the General Plan public outreach process, summary of public responses and issue themes, planning process hierarchy, as well as other useful information. Park Statistics: See this page for a succinct highlight of park information and statistics. It can be downloaded from the "Maps and Documents" section below. Visitor Survey: Thank you to all who have participated in the on-line Visitor Survey. Over a two month period, we received 1457 completed surveys! Your opinions about current and desired facilities, activities, and programming will help shape the General Plan. See "Maps and Documents" section at the bottom of this page for a link to the survey results. 1ST PUBLIC MEETING: The first of three public meetings to discuss the Cuyamaca Rancho State Park General Plan was held Wednesday, October 3, 2012 at 6:00 PM to 8:00 PM at the Viejas Casino – DreamCatcher Showroom. See "Maps and Documents" section below to download maps, documents and presentations from the 1st public meeting. California State Parks is conducting a comprehensive update of the General Plan for Cuyamaca Rancho State Park. A General Plan is a broad-based policy document that establishes a long-range vision and goals. A General Plan also provides direction on future types of improvements, services, and programs. An Environmental Impact Report (EIR) will be prepared as required by the California Environmental Quality Act (CEQA). The EIR will evaluate potential environmental effects associated with the adoption of the General Plan. The current version of the General Plan was adopted in 1986. The purpose of the General Plan update is to revise the plan to reflect changing conditions and issues, include additional state park lands that are now adjacent to Cuyamaca Rancho State Park, and to update the vision, goals, and policies set forth in the Plan. Public input will be used to help guide the development of the General Plan update. Cuyamaca Rancho State Park (CRSP) is located approximately 50 miles east of San Diego in a mountainous area consisting of oak woodland forest, pines and expansive meadows. It sits astride the crest of the Cuyamaca Mountains in the Peninsular Ranges, with Cuyamaca Peak at 6,512 feet, standing tall within the park boundaries. To the east, lies Anza-Borrego Desert State Park (ABDSP) while to the south is the small rural community of Descanso and generally the remaining areas are surrounded by the Cleveland National Forest with a few exceptions of private parcels in the Descanso Valley and near the Cuyamaca Reservoir. State Highway 79 runs generally through the Park. The Park was acquired for the California State Park system in 1933 and classified as a State Park in 1962. The Park encompasses approximately 24,700 acres, of which, 13,100 are designated as Wilderness and 3,200 are either Natural or Cultural Preserves. This Park features recreational experiences that are close to a large metropolitan area but yet at the same time feel well removed from urban life, with over 100 miles of trails and several major campgrounds and numerous wilderness, cultural, and historic interpretive opportunities. In 2003, the Cedar Fire burned 24,600 of the 24,700 acres in the Park, resulting in numerous park facilities being destroyed or damaged - from historic structures such as the Dyar House, to the loss of a popular family equestrian campground at Los Caballos in the northern part of the park. The Park is currently under the stewardship of the Colorado Desert District and the Montane Sector of the California Department of Parks and Recreation. 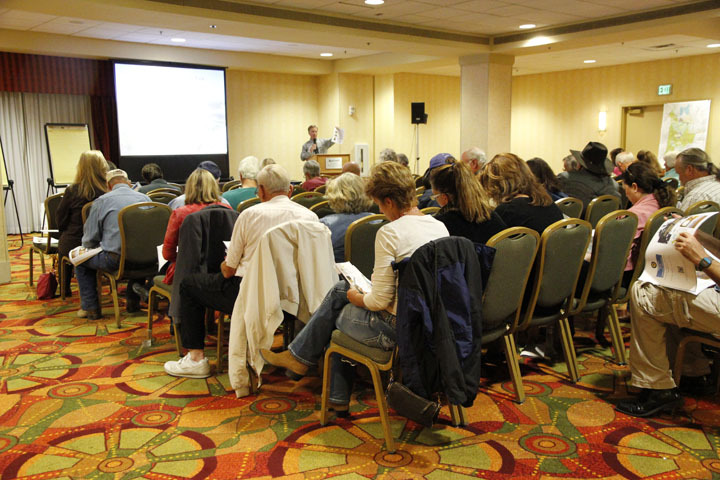 The third and final public meeting was held Tuesday, November 12, 2013 from 6:00 PM to 8:00 PM at the Marriott San Diego Mission Valley Hotel, in the Cabrillo Room, 8757 Rio San Diego Drive, San Diego, CA 92108. The first of three public meetings was held Wednesday, October 3, 2012. The second public meeting was held Thursday May 23, 2013. No additional public meetings will be held until the State Park and Recreation Commission hearing in fall 2014.